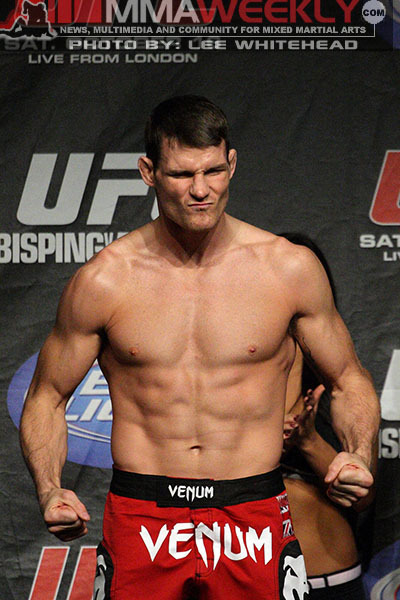 Wolfslair teammates will fight together at UFC 114 in Las Vegas, as it appears Michael Bisping is likely to return to action alongside his friend and training partner Quinton “Rampage” Jackson when he faces New Jersey native Dan Miller in a middleweight bout on the card. Sources close to the fight informed MMAWeekly.com on Monday that the bout has been offered and verbally accepted by at least one of the fighters, but no bout agreements have been issued at this point. The bout was originally reported by MMAJunkie.com. At UFC 110, Bisping stepped in and faced legendary former Pride champion Wanderlei Silva and did very well in the fight, but came up short losing a unanimous decision. Obviously not happy with the outcome, the Brit will look to get back on the horse in quick order with a fight in May. Following an impressive start to his UFC career, Miller has faced some of the best competition in the middleweight division, but he’s looking to bounce back now after two losses in a row. Having never been finished in his career, Miller came up a little short in his last two fights against the two top contenders in the 185-pound weight class, Demian Maia and Chael Sonnen. Now the AMA Fight Club fighter will try to get past the pride of Great Britain instead. UFC 114 is slated for May 29 in Las Vegas and will be headlined when former “Ultimate Fighter” coaches Quinton “Rampage” Jackson and Rashad Evans square off in a light heavyweight grudge match.